numbers. Try surprising your child with Puppy Cake Candles. Each pack contains six adorable candles. From customer reviews it sounds like these candles easily last through a chorus of Happy Birthday. That means that you might be able to reuse them a second time. Yay! And you don't have to use them only for children. 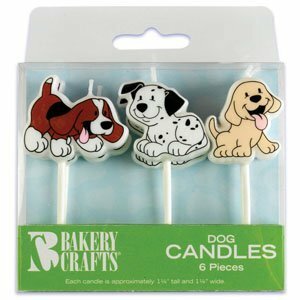 If you are of the ilk that celebrates dog birthdays (and I know you are) then these candles can be used in doggie cupcakes as well. Then you could sing a round of Puppy Birthday. HA! To order a set of Puppy Cake Candles for your next birthday bash, click here.